Here we are almost at the end of the second month of 2014 and I hope you have all finally recovered from the excesses of Christmas… culinary, alcoholic and financial. For those who may follow us on Facebook, I posted a blurb about my last foray of 2013, which netted me some delicious winter chanterelles. I also said that in the New Year my plan was to start a blog/ diary of a survey I planned to do is my little forest behind where I live. 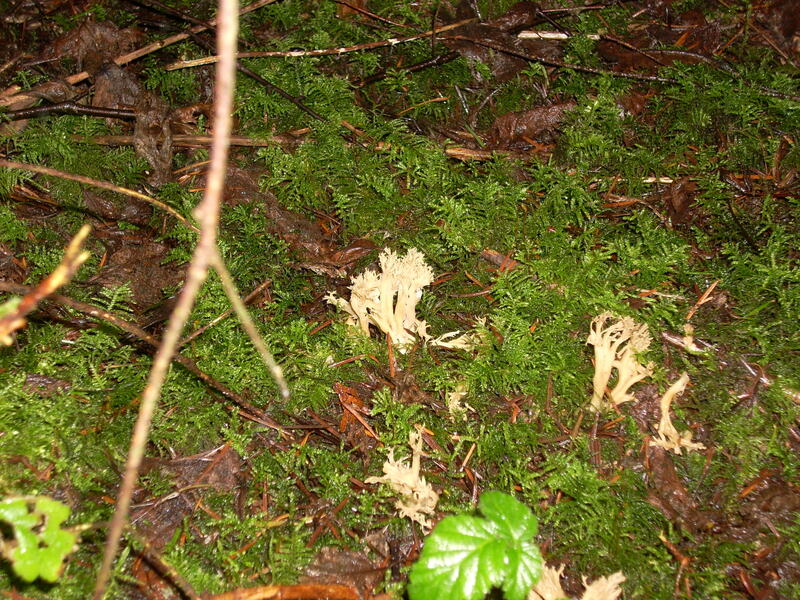 I had high hopes of heading out New Year’s Day and once again scoring a few pounds of Canthrarellus infundibulifomis. But alas it was not to be as I succumbed to the wretched chest cold that has plagued so many here on the coast this winter. Hacking and snorting, and runny of nose and rheumy of eyes, I was in no shape for bush whacking. Having barely recovered after 9 days of affliction, armed with cough medicine and antibiotics, C and I were off to Oahu for 10 days of sun, heat and relaxation. The first find of 20014…not a local but I do believe it is closely related. Upon closer examination I believe it to be Chlorophyllum molybdites or Green –spored Parasol. Very similar to our shaggy grey parasol, but in the case of the green spored parasol, it is not edible and is poisonous. A few days later on a trip to the northern shore of the island, to check out the big waves and the shrimp food -trucks, once again on a beach walk we spotted another specimen. This time it was actually growing on the beach in the sand and pine needles. I believe this one may be in the agaricus group or an Amanitia , but I am not too sure and really not too worried as I didn’t consume it and I am not sure when I will be back. For those interested or who may be heading over this winter, here is a web site that Duane Sept sent me… http://www5.uhh.hawaii.edu/~baperry/foh.html.ack … Good hunting. So let’s get back on track and let me focus on fungi growing on the Sunshine Coast during this lovely and mild, though somewhat foggy January. I was out and about January 28th and there is still an abundance of fungi out there. Barley out the back gate and there for all to behold, a beautiful flush of Trametes versicolour, or the chickweed of fungi as one author put it, Turkey Tails. They are just getting into their season now and a good medicinal to make a tea that will help optimize your immune system. 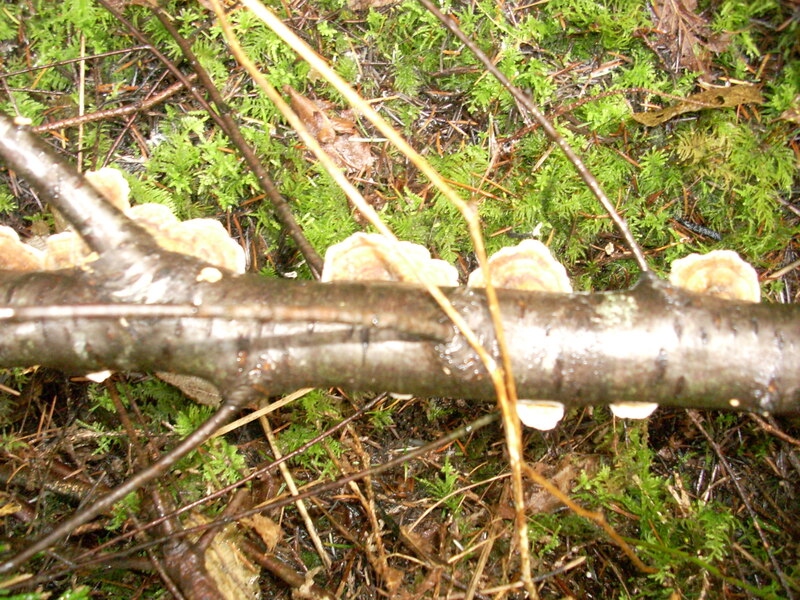 Just a few yard further down the path and I came upon some False oysters (Panellus mitis) small, bright white, growing on dead firs and easy to see with the branches bare and dark. I took a picture, but the quality is not good, so no image. Maybe later I can get a better one. Later after walking up Field road, I turned to follow a path through the clear cut, and there for about the first 100 yards were the Common Laccaria (Laccaria laccata). Some were burned with frost bite, others water-logged, but there were many of them. 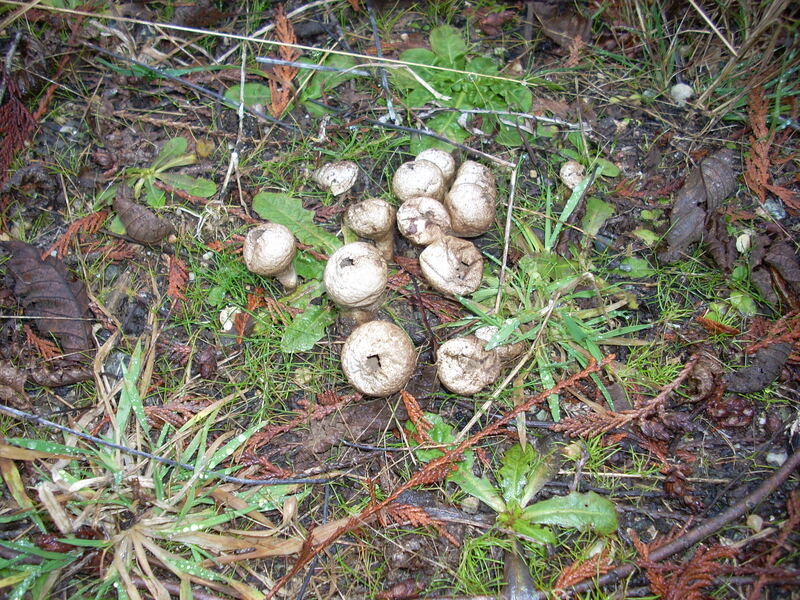 On the walk down through the cut, on the left side of the road, I spied a group of Lycoperdon pyriforme…puff balls…all but spent, but from the looks of them, a fairly recent occurrence. They must have come up during the relatively mild January we have had so far. 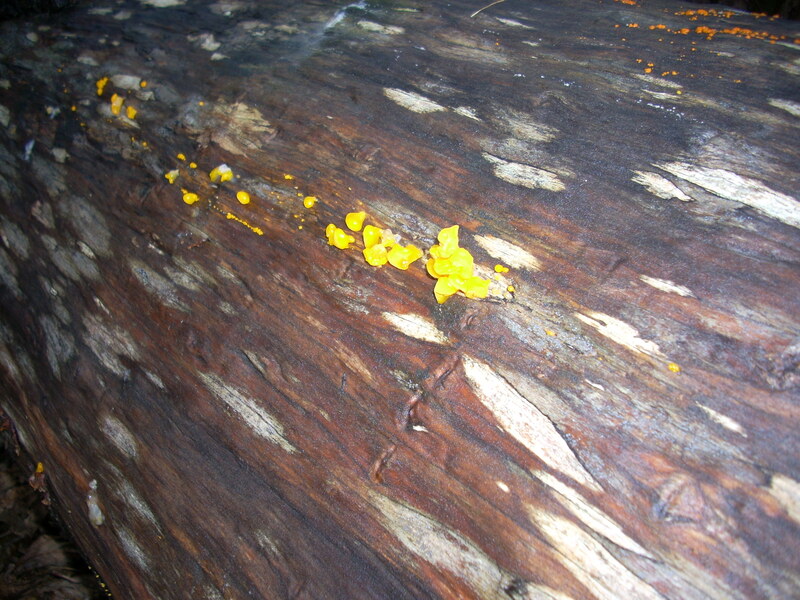 Also on my walk down, I came upon some orange jelly ( Dacrymyes palmatus), ripe and glistening.. I have seen lots of this everywhere I walk. Yesterday while up in Hidden Grove, I saw a glob the size of a large hens egg, just sitting there, glowing almost florescent orange among the greens of the moss the browns and grays of the trees. 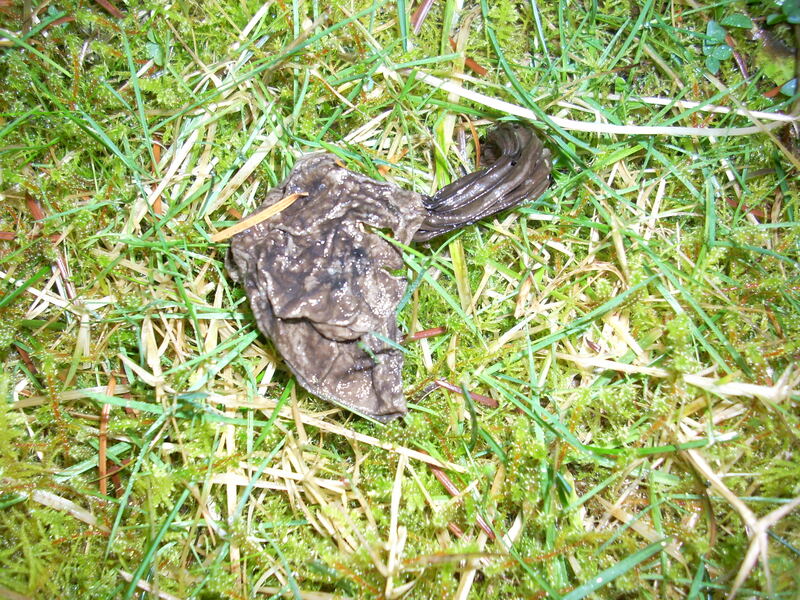 Last, but not least just at my back fence gate, having hung around all fall and into January, there is the Fluted Black Elfin Saddle ( Helvella lacunose)… looks like it has finally given up the fight, and the colours are not as a result of decay. There were other fungi out there, but many were a ruin of defrosted mush and therefore difficult to ID. I am sure there are many other species to be found, especially the polypores which grow all year round, such as the Red-Belted polypore (Fomitopsis pinicola); Tinder Polypore( Fomes fomentarius) and the Artist’s Conk(Ganoderma applanantum) to name just three. We live in a fantastically beautiful and magical place here on the coast with hundreds of species of fungi, growing all year long. Other Canadians are struggling through one of the coldest and stormiest winters in recent history. Get out there and enjoy our relatively balmy weather, see what you can find, take some pictures and let us know what you find. Also be sure to copy you r friends and family on the other side of the Rockies, with pictures of your finds in our green and not snow covered forests, and also one of you smiling on the beach in just a tee shirt! (Evil I know, but it is to get them back for the ribbing they give us for all the rain we get here the rest of the year). Come back from time to time and check out whats growing in the woods out there. Thanks Ann… I am still trying to figure this site out.